Elizabeth Gentry’s moody, tense novel Housebound takes place over the three days before the protagonist, Maggie, the eldest of nine siblings, is to leave home to work in a daycare center in the city. 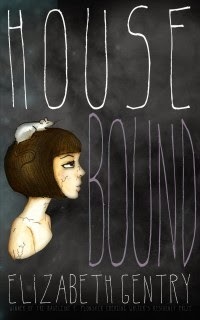 The characters of Housebound exist in a strange, half-formed sort of world; it’s similar enough to our own to be familiar, but the typical rules don’t all seem to be in place. The standards of time and geography feel oddly bent, lending the feel of a fairytale. Not far from home, Maggie wanders through the country and stumbles upon house after house, each containing nearly-forgotten family and acquaintances, each with new and upsetting things to reveal. But there is also temptation in learning things about the world outside her home. Maggie is repeatedly tempted by sugary foods, which are banned by her parents, just as she is tempted by the urge to explore further from her home and learn long-buried truths about herself and her family. Maggie’s parents and siblings are also given occasional control of the narrative, and as with Maggie, the reader is given glimpses into the desires that plague them as they march their way through the rigid schedule of their home life. The youngest children use the break from Maggie’s watchful eyes to explore forbidden places. Their mother, Hannah, plots a way to have a room to herself. As the family’s routine begins to crumble, Maggie shoulders the blame for welcoming change. Her family members feel their private desires and doubts rise to the surface. In this way, the novel is a study of cause and effect—the chain reaction caused by Maggie’s decision to leave home. It is established early on that, at least in the minds of Maggie and her family, her leaving is absolute. The family lives in a world of extremes. Either Maggie is with them, or she is no longer one of them. As a result, in her last few days at home, she slips into a new role in her family, or more accurately, the absence of one. This cuts her off from the stability she has known for so long, and gives her the freedom to travel farther, both physically and emotionally, than she has ever been able to before. Perhaps Gentry’s greatest achievement is her descriptions of the house itself and the way that the various characters describe it and interact with it. They evaluate its spaces and their purposes, recount its features like touchstones, and wonder about its secrets. When the house’s secrets are uncovered, so are the family’s, and they can no longer seclude themselves as they had before.